Competitive Price Single Side Heat Press Table for Insulating Glass.Heated Roller Press With Tilting&Suckers,Hot Roller Press Table for Insulating Glass,Single Side Heated Roller Press Machine. Standard Export Package or according to customers' demands. 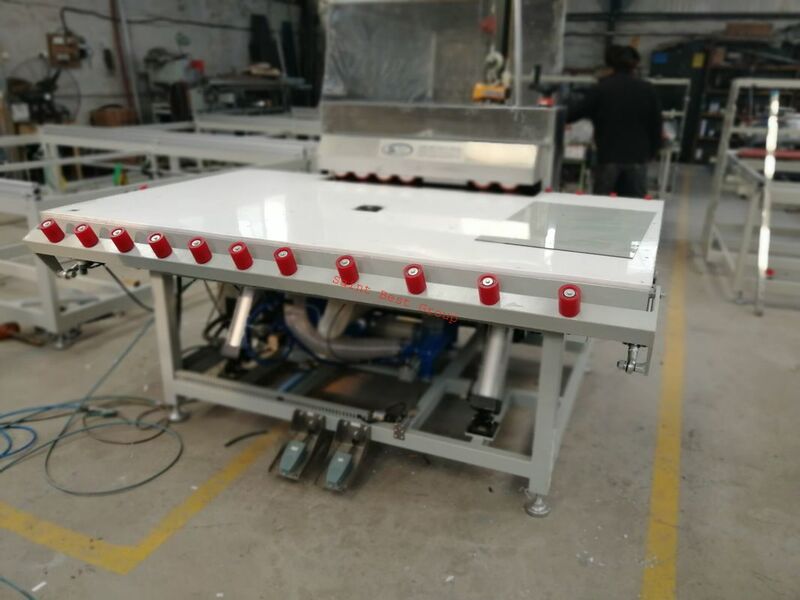 6 pairs far infrared Carbon Firbe Heating Lamps are used in this machine to heat the glass from the directions of both the top and the bottom, and it is possible to adjust the temperature automatically. SAINT BEST GROUP selected each part carefully , we are strive to quality first when machine production and test each machine before delivery. So we will provide the best machine for you.Single Side Heated Roller Press for Warm Edge Spacer with Tilting Table,Single Side Heated Roller Press,Heated Roller Press for IGU,Single Side Cold Roller Press Table delivery to Mexico,Heat Roller Press for Double Glazing,Single Side Heat Press Table delivery to Mexico;Single Side Heat Press Table for Insulating Glass.Heated Roller Press With Tilting&Suckers,Hot Roller Press Table for Insulating Glass,Single Side Heated Roller Press Machine. After machine production finished, the products will be tested in professional ways make sure its performance.Tilting Single Side Heated Roller Press With Suckers,Single Side Hot Roller Press Table to America,Tilting Single Side Heated Roller Press With Suckers,Single Side Hot Roller Press Table,Single Side Heated Roller Press for Warm Edge Spacer with Tilting Table,Heated Roller Press,Single Side Heated Roller Press for Warm Edge Spacer with Tilting Table,Single Side Heated Roller Press,Heated Roller Press for IGU,Single Side Cold Roller Press Table delivery to Mexico,Heat Roller Press for Double Glazing,Single Side Heat Press Table delivery to Mexico;Single Side Heat Press Table for Insulating Glass,Single Side Roller Press Machine for Aluminum Spacer,Duraseal Spacer&Super Spacer;Single Side Cold Roller Press Machine,Cold Roller Press Machine for Aluminum Spacer Insulating Glass,Super Spacer Double Glazing Press Table,Cold Roller Press Machine for Double Glazing,Cold Roller Press Machine for Insulating Glass,Cold Roller Press Machine for Double Glazed Unit,Cold Roller Press Machine for Insulated Glass Unit. to make sure customer will receive the machines they ordered Intact.Heated Roller Press With Tilting&Suckers,Hot Roller Press Table for Insulating Glass,Tilting Single Side Heated Roller Press With Suckers,Single Side Hot Roller Press Table,Single Side Heated Roller Press for Warm Edge Spacer with Tilting Table,Heated Roller Press,Single Side Heated Roller Press for Warm Edge Spacer with Tilting Table,Single Side Heated Roller Press,Heated Roller Press for IGU,Single Side Cold Roller Press Table,Insulating Glass Cold Roller Press,Double Glazing Cold Roller Press,Insulating Glass Roller Press Machine,Double Glazing Roller Press Machine,Mini Insulating Glass Roller Press Machine,Mini Double Glazing Roller Press Machine,Single Side Insulating Glass Roller Press Machine. By offering this support, we make sure the cutomer start the business smoothly, to realise win-win cooperation.Single Side Double Glazing Roller Press Machine,Single Side Heated Roller Press for Warm Edge Spacer,Single Side Heated Roller Press Machine for Warm Edge Spacer,Hot Roller Press Machine, Hot Roller Press, Heated Roller Press, Heated Roller Press Machine, Cold Roller Press Machine, Cold Roller Press, Thermo-compressor, Hot Roller Laminator,Heated Roller Laminator, Single Hot Roller Press Machine, Single Side Roller Press, Heated Roller Press for Insulating Glass Units, Hot Roller Press for Insulating Glass Units, Heated Roller Laminator for IG Units, Single Side Hot Roller Press Machine for Insulating Glass, Single Side Hot Roller Press Machine, Single Side Hot Roller Press, Hot Roller Press, Hot Roller Press Machine for IGU, Hot Roller Press Machine for DGU, Hot Roller Press Machine for Warm Edge Spacer, Hot Roller Press for Flexible Spacer, Hot Roller Press Machine for Rubber Spacer, Hot Roller Press for Butyl Tape, Hot Roller Press Machine for Rubber Spacer. Our company owns excellent team of research and development and technician which lay foundation of high-quality machine. We use are imported components and after machine production finished, the products will be tested in professional ways make sure its performance.Hot Roller Press for Butyl Spacer, Single Side Heat Roller Press Machine for Insulating Glass, Single Side Heat Roller Press Machine, Single Side Heat Roller Press, Heat Roller Press, Heat Roller Press Machine for IGU, Heat Roller Press Machine for DGU, Heat Roller Press Machine for Warm Edge Spacer, Heat Roller Press for Flexible Spacer, Heat Roller Press Machine for Rubber Spacer, Heat Roller Press for Butyl Tape,Heat Roller Press Machine for Rubber Spacer, Heat Roller Press for Butyl Spacer, Mini Heat Roller Press Machine for IGU, Mini Heat Roller Press Machine for DGU, Mini Heat Roller Press Machine for Warm Edge Spacer, Mini Heat Roller Press for Flexible Spacer, Mini Heat Roller Press Machine for Rubber Spacer, Mini Heat Roller Press for Butyl Tape, Mini Heat Roller Press Machine for Rubber Spacer.